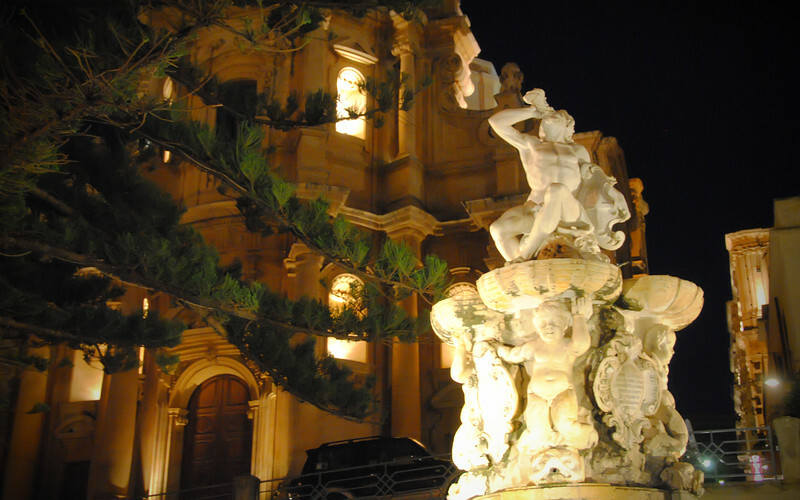 In South-Eastern Sicily, there are eight towns in the Val di Noto (Noto Valley) that were rebuilt after a huge earthquake in 1693. 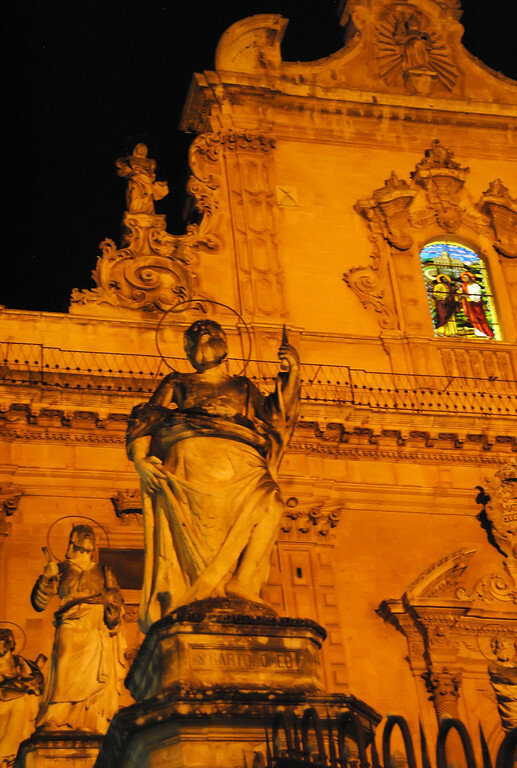 Considerable work was done to populate these towns with the popular Baroque architecture of the day. 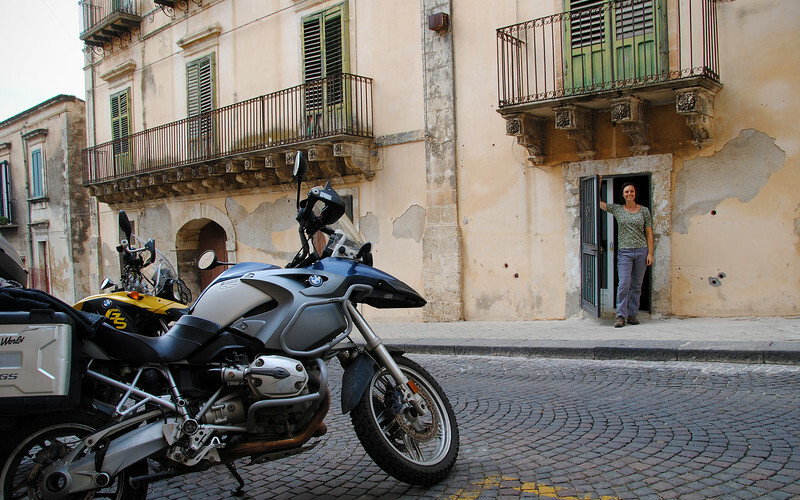 Noto itself was only 40 kms away from Siracusa, so we hopped on the bikes one afternoon and headed into town to see some cool architecture. The infrastructure is not very good in the historic centre. Every afternoon after lunch, the town shut off all the water so all the buildings and businesses in the area had to rely on huge water tanks on-premise that were replenished when the water supply was turned on again in the morning. We had to make sure to turn on the pump every morning to re-fill our tank otherwise no shower, flushing toilets or washing dishes after lunch! Despite all this, it was a cool experience, living for a couple of days in the centre of town. 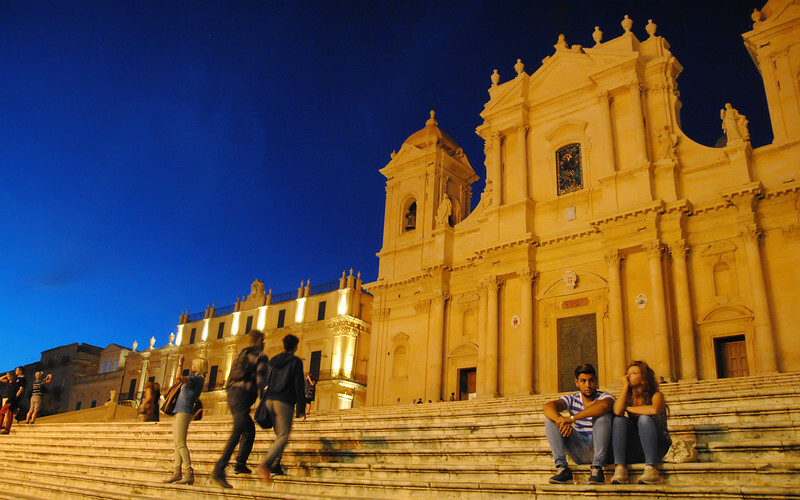 We're going to do things a little bit different while we're here in the Val di Noto. 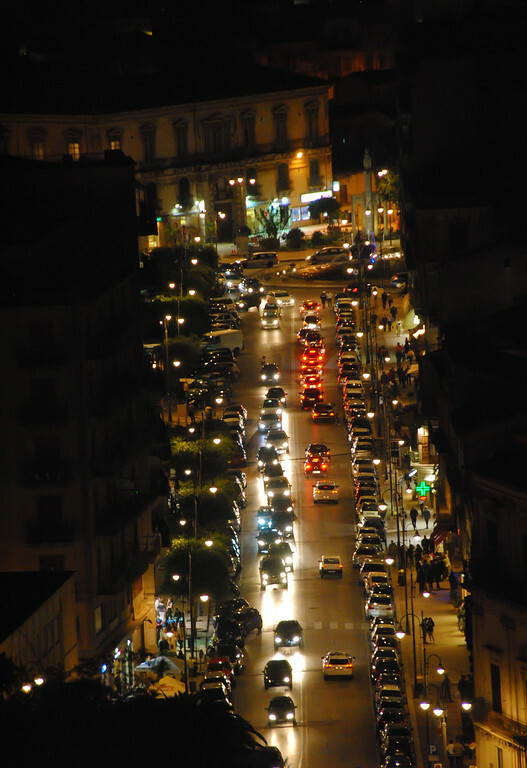 Because all the towns look so empty during the middle of the day during the Italian riposo (siesta), we decided to take an afternoon nap ourselves and then do some sightseeing in the evening for a change. 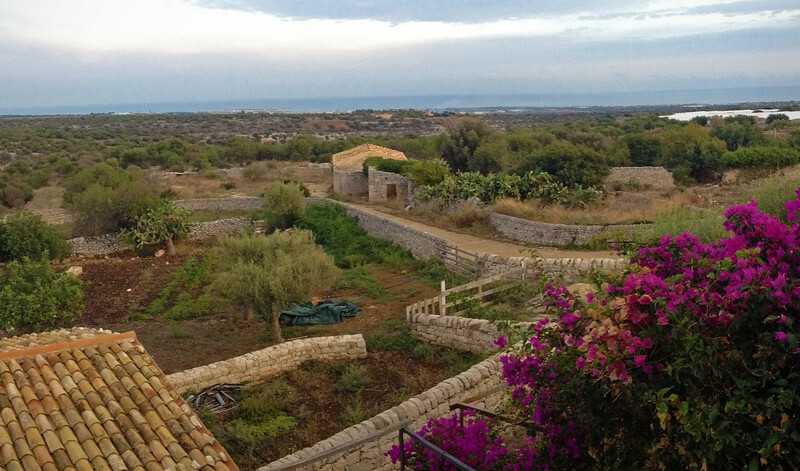 Living la vita Siciliana! So many people walking around! I really don't understand the whole riposo thing. I can see that maybe in the middle of the summer, you'd want to sleep off the afternoon heat indoors where it's nice and cool. But this late in the season the days are actually pleasant: mid-to-high 20s. Why keep the same schedule all year round? More expensive restaurants. Can't eat here or we'll go Baroque. 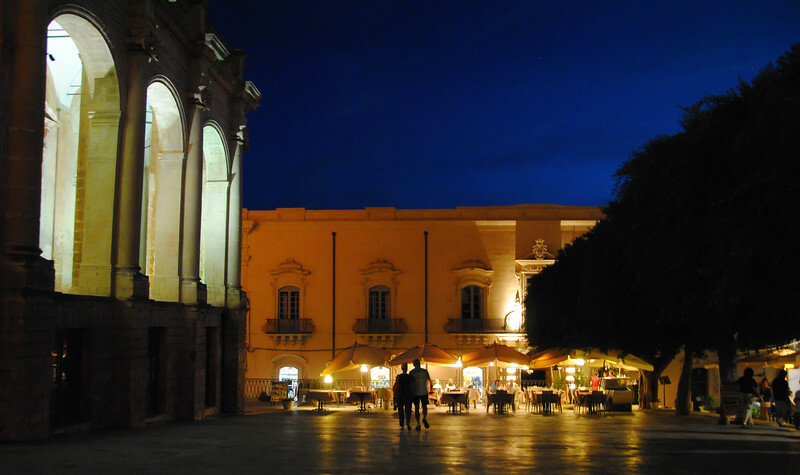 Just outside of the historic centre, we found a take-out pizzeria selling large pies for €5. Finally cheap food! 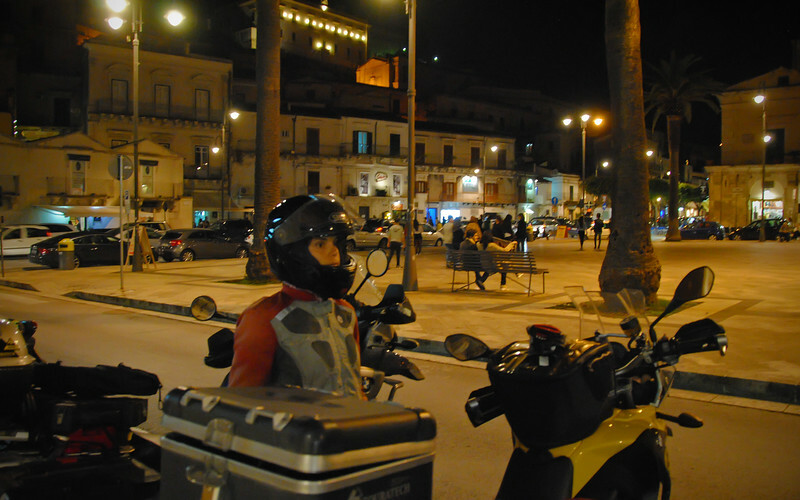 We're finding food generally is cheaper in Sicily than the mainland, but the tourist traps in the middle of all the attractions still gouge the holiday crowd. Why is the beach so empty? 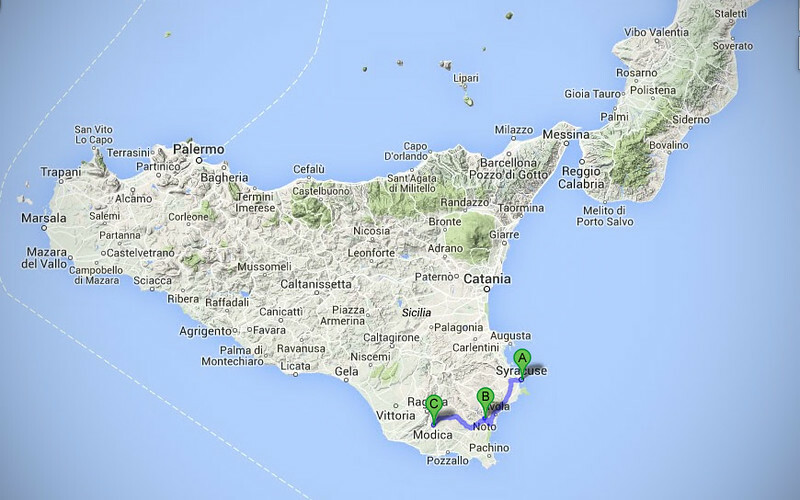 We really wanted to hit at least one of the famous Sicilian beaches while we're down here. Calabernardo Beach is the closest to Noto, less than 10 kms away, so we hopped on the bikes to get some sun in. The place was entirely empty! We found out why... less than 5 minutes after we put down our beach towels, it started to rain. Of course we checked the forecast before we came. 60% chance of showers means 40% chance of sun, doesn't it? 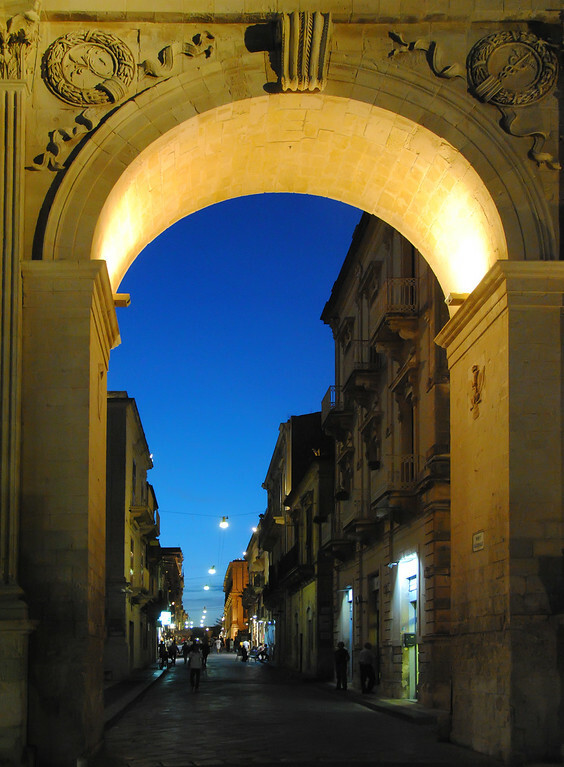 Our next stop is another Val di Noto city called Modica. It's less than an hour away from Noto, so we take the backroads through what's known as the Iblean Plateau. It's the same kind of limestone geography that we saw at Pantalica. 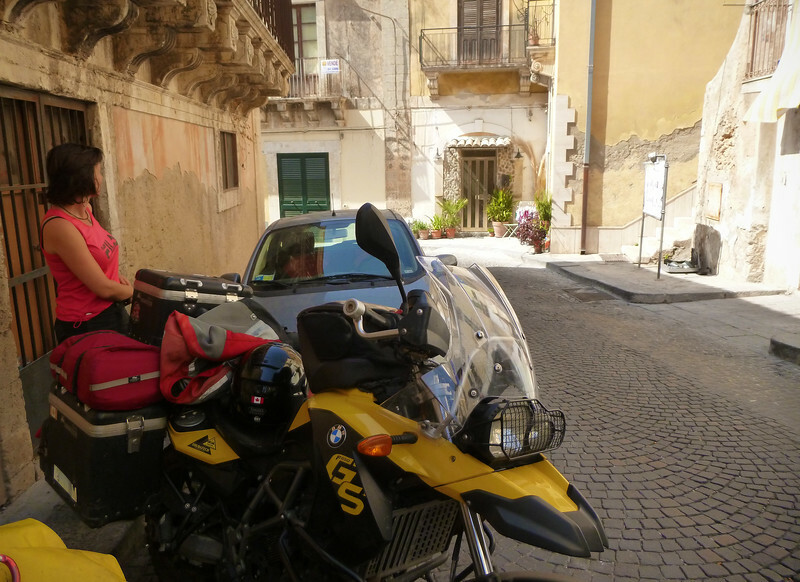 We've booked another place through AirBnB, a farm about 15 kms outside of Modica, and we ride for a while through very narrow laneways lined on both sides by low stone walls that Neda says reminds her of Pula. 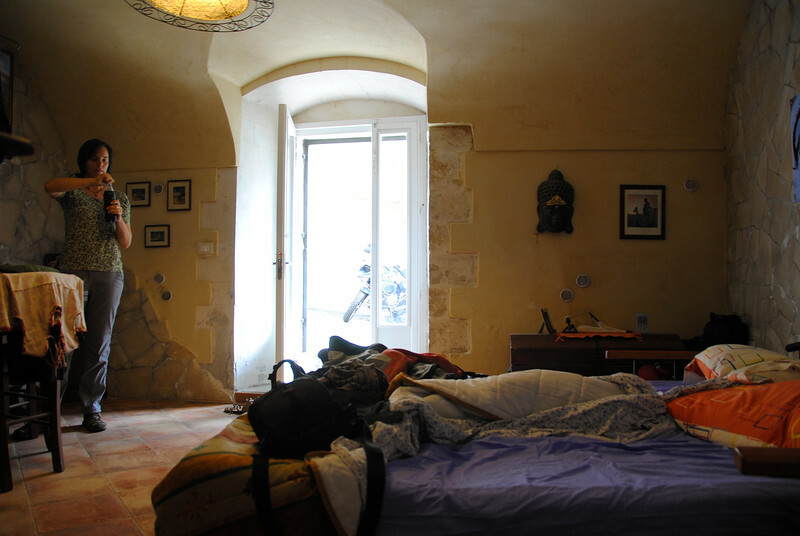 We really like our AirBnB stays, mainly because of the price point, but also because most of the owners are really cool people to talk to. The owner of this farm was originally from Bologna, but her family moved here recently. 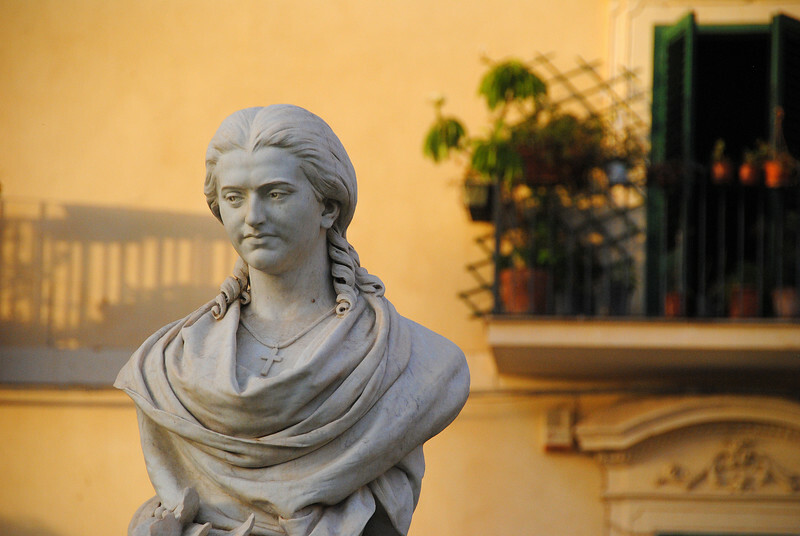 She told us all about the good and bad about Sicily. Apparently the Mafia is very real and very present down here. As a tourist you don't really see it, but if you try to start any kind of business, they get involved very quickly. I've always wondered why Sicily seems to be the very poorest part of Italy, given that it's got such nice weather, it should really be raking in the Euros due to all the tourist activity. 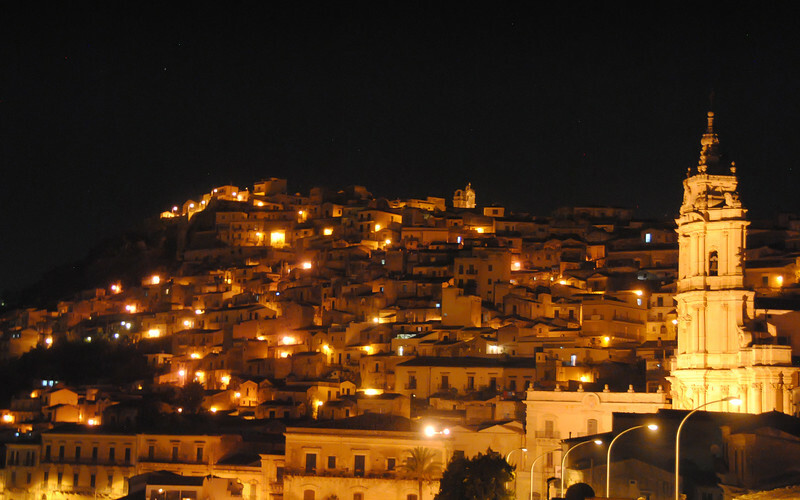 However it was explained to us that companies are hesitant to start up businesses here because of the mafia and the government corruption, so there's very little investment in Sicily. 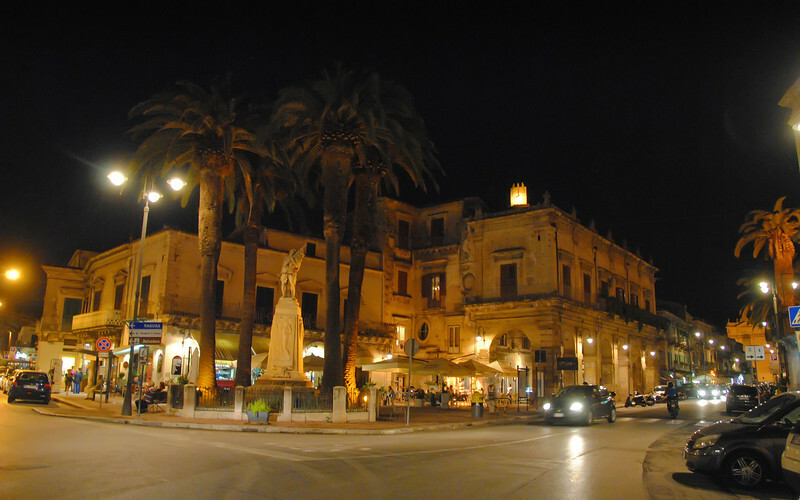 We're continuing our night-time tours of Val di Noto. 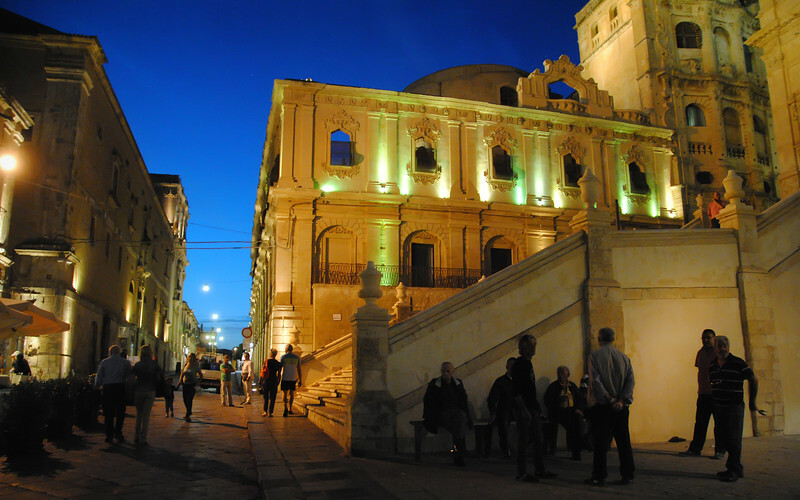 We hop on the bikes after sunset and head into Modica where our first priority is to find a chocolate store. Modica chocolate is well-known for it's particular dry, grainy texture, they say once you have it, you can't go back to regular milk chocolate. I don't know about that, but we did enjoy it a lot that we bought several bars for the trip, but they all magically disappeared before we even left the farm. Where did they all go, Neda...? 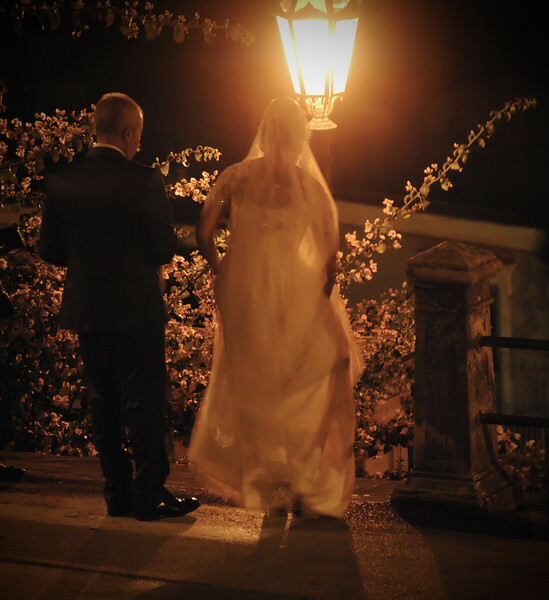 *Everyone* comes out in the evenings! Back on the farm next day, a huge storm hits the area. 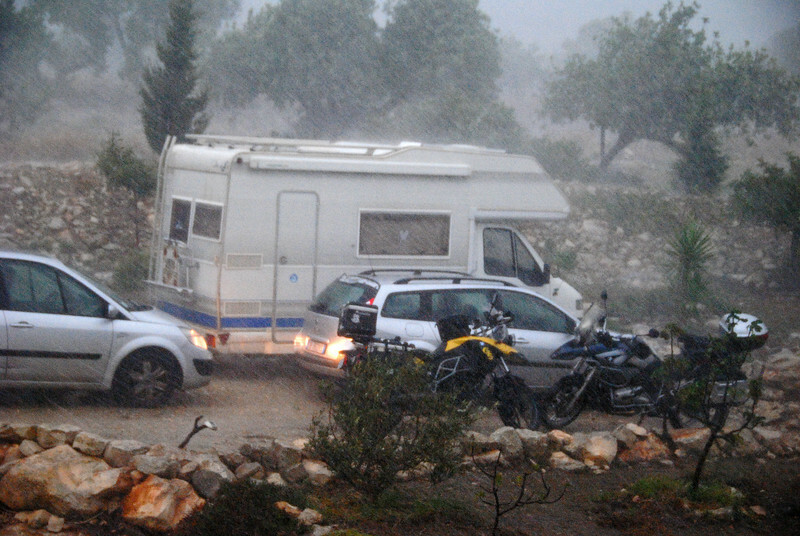 We watched from our bedroom window as the water pounded our bikes parked outside. The owners told us that a mini-twister touched down a few kms away! So glad we decided not to camp!